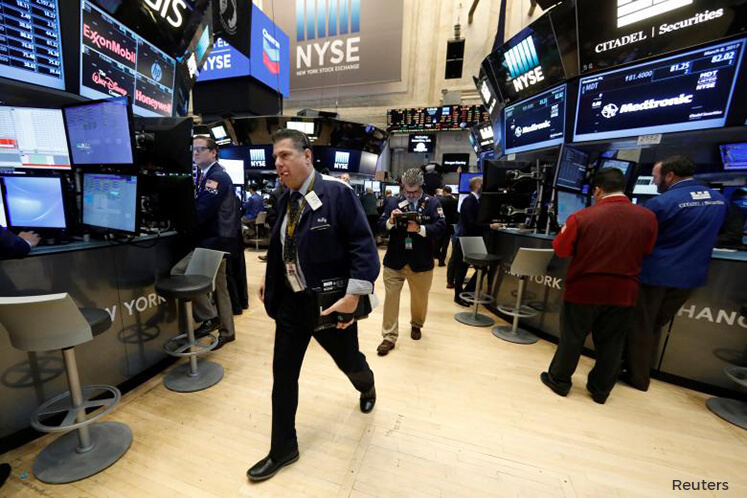 NEW YORK (March 28): US stocks struggled for direction on Tuesday as investors chose to look beyond President Donald Trump's first major policy setback, while awaiting comments from several Federal Reserve officials, including Fed Chair Janet Yellen. A failed healthcare Bill sent the dollar and stocks down on Monday as investors questioned Trump's ability to push his ambitious agenda of tax cuts and simpler regulations in Congress. However, markets steadied after Trump said he would turn his attention to "big tax cuts". The White House later said it would lead the role in reforming the US tax code, eyeing an August deadline. "Yesterday's move was actually quite a small unwind and was quickly opposed, and it tells me that investor sentiment hasn't been unduly damaged by the failure of that (healthcare) legislation," said James Athey, Investment Manager at Aberdeen Asset Management. "We would see this volatility to be normal and healthy and not something to be overly concerned about at this stage." Investors are awaiting Federal Reserve Chair Janet Yellen's speech at a conference in Washington, where she could provide some insight into the timing of the central bank's next interest rate hike. Other Fed officials scheduled to speak at separate events include Fed Board Governor Jerome Powell, Dallas Fed President Robert Kaplan and his Kansas City counterpart, Esther George. At 9.39am ET (1339 GMT), the Dow Jones Industrial Average was up 2.55 points, or 0.01 percent, at 20,553.53, the S&P 500 was up 1.24 points, or 0.05 percent, at 2,342.83 and the Nasdaq Composite was up 6.20 points, or 0.11 percent, at 5,846.57. Four of the 11 major S&P 500 sectors were slightly lower, while three gained and the rest were little changed. Shares of Tesla rose 3.3 percent to US$279.10 after the maker of electric cars said Chinese technology giant Tencent Holdings had paid US$1.78 billion for a five percent passive stake in the company. Amazon.com was the top stock on the S&P and the Nasdaq, with a 0.8 percent gain, after the company agreed to buy Middle East online retailer Souq.com. Red Hat jumped 5.1 percent to US$86.41 after the Linux operating system distributor reported quarterly revenue that beat analysts' expectations. Advancing issues outnumbered decliners on the NYSE by 1,433 to 1,103. On the Nasdaq, 1,172 issues rose and 1,028 fell. The S&P 500 index showed 10 52-week highs and no new lows, while the Nasdaq recorded 37 highs and 10 lows.